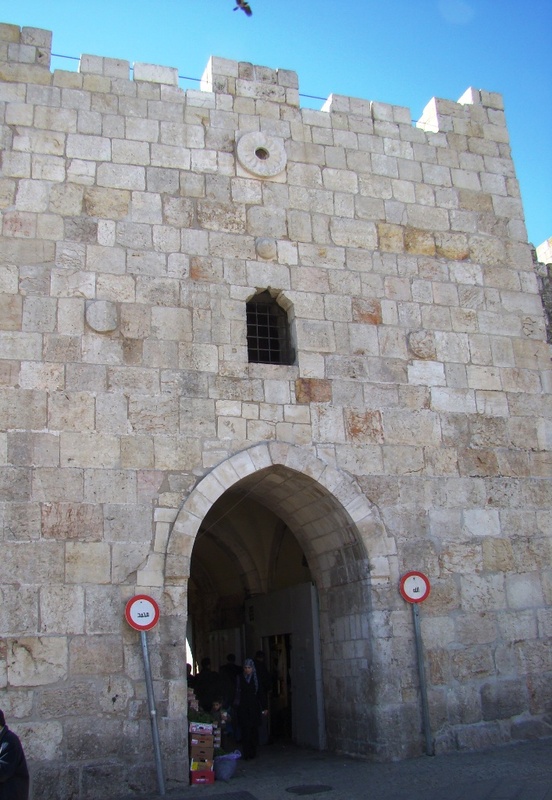 Yesterday our post showed Jerusalem’s Golden Gate, located on the eastern wall of the city. I recently came across a helpful sketch which shows the present walls and gates of Jerusalem. Old City Map from Wikimedia Commons. Shows Jerusalem's Walls and Gates. 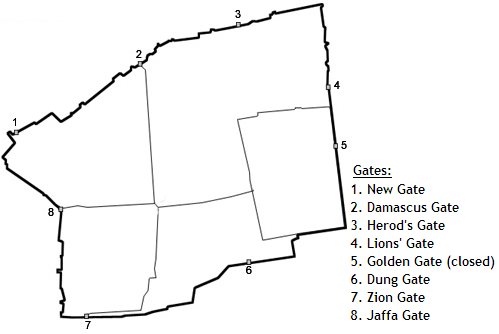 Herod’s Gate is located on the north side of the city (see #3 above). Herod's Gate in Jerusalem. Located on north wall. Photo ©Leon Mauldin. The designation “Herod’s Gate” is based on the erroneous notion that just inside the walls was the palace of Herod Antipas. That view has no historical basis. The gate is also called “Flowers Gate.” You can see the floral design at top center. Floral Design on Herod's Gate.. Photo ©Leon Mauldin. This gate leads into the Muslim Quarter of the Old City from the northern city walls. Sha’ar HaPerachim is situated east of the Damascus gate and adjoins the Moslem Quarter of the old city. Archeological excavations show that the wall between the Damascus Gate and Herod’s Gate has irregular channels reflecting that sections of the walls were built on top of structures dating back to the time when emperor Hadrian built Aela Capitolina on the site of Jerusalem. This entry was posted on Friday, July 8th, 2011 at 9:22 PM and is filed under Bible History and Geography, Bible Study, Israel. You can follow any responses to this entry through the RSS 2.0 feed. You can leave a response, or trackback from your own site.